Corner of Pacoima and Bear Valley Road. 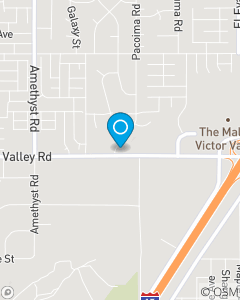 We are just west of The Mall of Victor Valley. At State Farm, we give our State Farm customers a different kind of map...a life map, and it leads to security knowing that you have the right coverage to protect you and your family, to recover from the unexpected and to making your dreams for the future a reality! We are here to service all of your insurance needs. We speak Spanish and Chinese.